The helping hand of inclusive growth. Inclusive growth creates opportunity for all and distributes the dividends of increased prosperity, both in monetary and non-monetary terms, fairly across society. I welcome the news that the SNP’s Cllr Kate Campbell’s tenure as Edinburgh’s Housing and Economy chief will mark a move away from just talking about economic growth, to a narrative of making sure the benefit reaches into every neighbourhood. There will be some that see her comments as an implicit criticism of the previous SNP Councillors that held the role, not least Cllr Gavin Barrie and Cllr Frank Ross, but progressive minds in other parties will support a return to the kind of vision Labour’s Council Leaders had for our Capital. We know, of course, that the SNP are the cause of Scotland’s attainment gap crisis. Indeed, despite Scotland falling nine places in international educational league tables, just last month SNP Councillors voted with the Conservatives at COSLA to impose a real terms pay cut on our teachers. How can we tackle educational attainment if we don’t value teachers? We can’t. Furthermore, in recent weeks we’ve seen the SNP work with the Conservatives to prevent reform of the Council Tax and to delay the transfer of welfare powers to Scotland. Are these the actions of a party that’s concerned about fighting poverty? They’re not. Indeed, last week I cautiously welcomed a SNP proposal to give the very poorest households additional support to buy food, but I did wonder if a voucher for 16p per day more than the Tories provide is enough? It’s not. 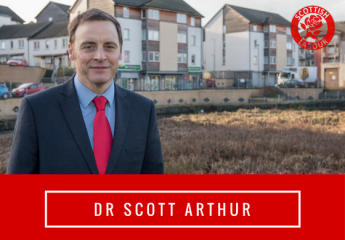 I’m proud that Scottish Labour believes that everyone should benefit from our prosperity. That’s why, against fierce SNP opposition, we support the Child Poverty Action Groups “Give Me Five” campaign which asks the Scottish Government to raise child benefit by just £5 a week, and so lift 30,000 children out of poverty. Let’s hope, therefore, that “inclusive growth” is more than a slogan and the philosophy spreads to all corners of our city, including Holyrood. ← Oxgangs Primary shows why it’s time to end PFI in Scotland.